Most of us love avocado, just sliced in a salad or in guacamole. We love it because of the flavor, the color and the nutrients. 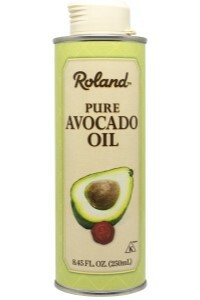 The avocado is also used to make an avocado oil. It takes about 15-20 avocados to make 8 fl.oz. of avocado oil. This Roland oil is a cold pressed extra virgin gourmet oil, fine, pure, never blended avocado oil and is the result of many years of developing and refining the recipe. Avocado oil is more neutral in flavor than olive oil and can be used for heating, but not deep frying. Use the avocado oil for your fish recipes, in your guacamole, or in hummus and salads, when roasting vegetables or as a dip.